Rockstar Energy Suzuki’s Kevin Strijbos raced to his first MXGP race win of the season at today’s Czech GP at Loket as team-mate Clement Desalle was forced to withdraw from the second race because of an injured left scaphoid. 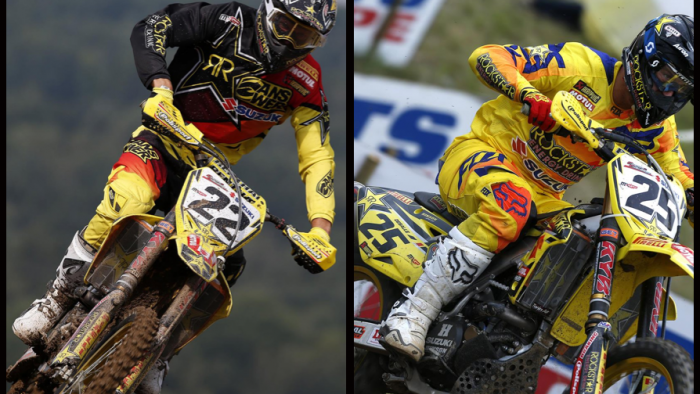 A stuffy Grand Prix of Czech Republic around the fast and daunting inclines of Loket was another ripe hunting territory for Rockstar Energy Suzuki World MXGP as Strijbos sprinted to second position overall on his works RM-Z450 today and was just two points from his first overall victory since 2007. Team-mate Desalle rode to seventh place in the first moto but is now likely sit out the remainder of the season to allow a fractured left scaphoid bone to heal fully. Around 21,500 spectators sought positions on the vast hill overlooking the quaint and picturesque town deep in the west of the country and close to the German border for what was round 14 of 17 in the FIM Motocross World Championship. Strijbos had seized fourth position in qualification on Saturday and had a decent pick on the start-line for the short downhill drop into the first turn. Using the power of his RM-Z450 the Belgian sliced through to second place behind his team-mate in the formative stages of the opening moto. The Suzukis ran one-two for three laps until Strijbos upped the pace and Desalle began to struggle with his wrist and also race fitness and Strijbos escaped to claim his first moto triumph this year by almost 10 seconds from Jeremy Van Horebeek. In the second moto Strijbos was running the closest he has been to a Grand Prix success for seven years and his third at Loket. The 28 year old circulated behind Jeremy Van Horebeek with Antonio Cairoli leading for almost the entire duration of the race. He pushed to overtake his countryman and snare second place which would have been enough for the top step but ended up watching Van Horebeek catch and pass Cairoli. Strijbos was close to the back of the champion on the final lap but couldn’t demote the Sicilian. His one-three results were still enough to be runner-up and toast a best finish yet of 2014, as well as his seventh podium of the year. Desalle was returning to Grand Prix action after missing the trip to Finland through pain caused by the second moto crash at round 12 in Sweden. The Belgian was lacking fitness and some confidence and his feeling around Loket was hardly improved through a run-in with Steven Frossard on the first lap of the Qualification Heat on Saturday where both riders crashed. Desalle was unhurt but was still nursing discomfort with his left wrist – injured in Italy in June – and was finding some of the steep and fast descents around Loket tough to deal with. A seventh in the first moto was followed by a meeting with the team in which a decision was made for him to cease any racing activity and allow the wrist fracture to heal; the ailment has prevented effective training or preparation since the Grands Prix in Italy/ Germany. With three rounds and eight weeks of the season remaining Desalle’s participation for the races in Brazil and Mexico look doubtful. In terms of the MXGP championship standings Strijbos is just 15 points behind his team-mate and the top-three of the contest. The team’s home Grand Prix is next on the calendar with the rippling sand of Lommel representing a five-minute drive from Rockstar Energy Suzuki World MXGP HQ. The Belgian fixture takes place next weekend on August 3rd.